Get Totes Ready for Spring! To welcome in Spring, we’re giving our customers premium organic canvas tote bags, along with samples you’ll need this Spring and Summer. Order yours today. Free with every $100 purchase. Enjoy this free gift, free shipping and freedom from pests! Keep pests away — without killing, without poisons™. Safe for use where children and pets may play, when used as directed. Made with plant-powered essential oils. 100% naturally effective – guaranteed, or your money back. Continuous protection for up to 90 days. Order Today, Get Your Free Gift! 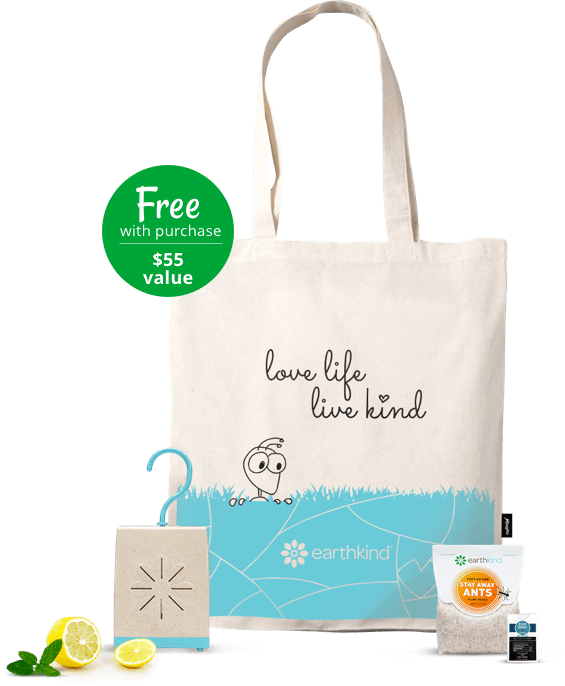 Another reason to feel good about shopping EarthKind – our purchase of these premium organic totes provides a meaningful contribution directly to K-12 non-profit environmental literacy projects. Spring Promotion runs from the first day of spring, March 20, 2019, until Earth Day, April 22, 2019, or while supplies last. Spring Promotion gift with purchase consists of one heavy-duty, premium organic tote, plus EarthKind product samples (makeup varies by state availability). Orders of $100 or more, before tax, qualify for a free gift with purchase. Only one gift with purchase will be sent per qualifying order.